The Crusaders from Monroe Woodbury have won the innagural “Brawl for the Belt”…this one definitely lived up to it’s hype! The dual was decided on the final match of the evening when MW’s Marco Vespa decisioned MV’s Tyler Lynch in sudden victory! The energy in the gymnasium at Minisink Valley was palpable all night and it came to head prior to the final match of the evening pitting the two state qualifiers against each other. Minisink won 8 of the 15 matches but it was Monroe who was able to pick up the necessary bonus points and notched a 39-34 win! There were no losers last night – just two great programs laying it on the line! Great job by both teams! This event has provided Section 9 wrestling with a much needed “shot in the arm”…Hopefully there will me many more duals like this in the future! Go S9!!! Arlington won the team title at the Wizard Duals followed by 2nd place Washingtonville and 3rd place Saugerties. Bandon Bobe (145) and Nick Solek (170/182) both went 5-0 for Washingtonville. Monroe Woodbury crowned 3 champions and won the team title at the Ridgefield Challange. The Crusaders scored 197.5 team points despite sitting a few regulars. St. Anthony’s (CHSAA) crowned 4 champs and took 2nd in the team race and they were followed by Newtown, CT with 153 team points. Earning titles for Monroe Woodbury were Evan Barczak at 160, Kyle Strauss at 182, and Kendall Elfstrum at 195. Also placing in the top 4 for the Crusaders were Nick Scancarello (2nd @ 99), Dylan Earl (3rd @ 106), Emanuel Ward (4th @ 126), Anthony Sountis (2nd @ 132), Louis Libutti (3rd @ 138), Tom Fini (2nd @ 145), and Sam Santander (4th @ 170). Valley Central crowned 4 champions, placed 12 in the top-6, and finished 2nd in the team race. Winning titles for VC were Matt Romano (113), Robert Satriano (126), Mark Ohanian (170), and Tyler Bohenko (220). Saugerties did not crown a champion however they placed 9 in the top-6 and finished 4th as a team. Kingston placed 5th as a team with 7 place winners. They had 2 champions in Chris Bouton (120) and Nijee Noble (152). Noble recorded his 100th career victory with a tech in the semifinals. Highland had 4 wrestlers place and also had a champ in Matt Malherio who won the crown at 138. Washingtonville had 6 placewinners while Marlboro had 1. Minisink Valley had 10 finalists and crowned 6 champions on their way to the team title! Winning titles for MV were Connor Greiner (126), Vinny Vetrano (132), Dom Vetrano (138), Joey Yanis (182), Andrew Covais (195), and Andrew Fenner. Vinny Vetrano recorded an impressive 5-0 victory in the finals over Ian Houck from Rondout Valley. Middletown had 3 champions and finished 2nd in the team race. Taking home titles for Middletown were Justin Morales (99), Cameron Green (106), and Nate Garcia (152). Monticello’s Patrick Owen defeated Minisink Valley’s Tyler Lynch in the semis and Sean Savacool in the finals earning him the 120 pound title and also the MOW award! Other Section 9 titles went to Noah Curreri (E/L/SW, 160), Jeffrey Kiluba (Red Hook, 170), and Ryan Ellefsen (Goshen, 220). Wallkill defeated North Rockland 52-18 in the final to capture their 4th consecutive Wallkill Duals Title. Avery Ellison-113, James Faison-120, Andrew Davis-126, Brad Bonner-132, Kraig Thomas-152, Brian Mascaro-170, and Billy Kras-195 all went 5-0 for the Panthers. Cornwall took 3rd place in the team race and saw undefeated performances by Christian Prokosch (99), Steve Gazzillo (145), and Will Leonard (182). Monroe Woodbury had 5 finalists and crowned 3 champions om their way to the team title at the Kohl Invitational. 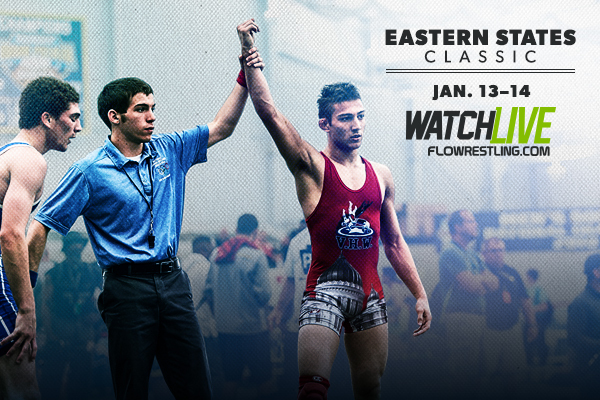 Marco Vespa was champion at 113 and he was chosen as MOW of the tournament. Also taking home titles for the Crusaders were John Minnies (160) and Kendall Elfstrum (182). Jonathan Vargas (170) and Samson Perez (195) also made it to the finals for Monroe. Port Jervis had 3 finalists and crowned 1 champion taking 4th as a team. Jason Butler was the champ at 170 while Carson Sauschuck (120) and Scyler Phillips (220) also made it to the finals. The combined career records for the 2017 ESC finalists is 3,816 (wins) and 482 (losses)! The season record for the finalists is 690-17! These numbers are about to change….here we go!!! Day 1 is in the books at the 2017 Eastern States Classic. Section 9 has 8 wrestlers in the quarter final round and 17 others still alive in the consolation bracket. Wrestling begins at 9:00 am tomorrow. Take a look at tomorrow’s quarterfinal match-ups as well as the 8 wrestlers alive in the consies for each weight class! We’ve also listed the results for every Section 9 wrestler at the bottom. Noah Curreri of Eldred/Liberty/Sullivan West was the 160 pound champion notching a pin, tech fall,and a major decision in the finals. Noah was selected as the upper weights MOW for the tournament! Saugerties finished in 6th place as a team with Colby Amell (3rd @ 99), Jimmy Heinlein (3rd @ 113), Nate Cantwell (4th @ 132), and Jimmy Ball (2nd at 195) all finishing in the top 4. Warwick had 3 champions in Lucas Wightman (152), Ryan Ferro (160) and Harrison Parrelli (195). Ferro pinned NYS placewinner Grant Cuomo in the finals and was named MOW of the tournament. Austin Taylor took 3rd at 285 and Andrew Wierzbicki (170), Hunter Brown (106), and Drew Greco (99) all finished in 4th place. Pine Bush’s Dylan Greer took home the title at 138 while Kevin Urena finished 2nd at 106. Jordan Suarez (99), Derrick Magsamen (126), and Shaun Burgos (145) all finished 3rd while Tommy Askey (120) took 4th. NFA had four wrestlers finish in the top 4 at the Chris Hernandez Memorial Tournament. Luke Fischer was crowned champion at 113, Matt Slepoy took 3rd at 99, and Connor Leggett (152) and Diego Wilson (195) finished 4th. Rondout Valley placed 4 wrestlers in the top 4 and finished 2nd in the team race behind Massapequa. Ian Houck finished 2nd at 132 after losing 5-2 in the finals to tournament MOW Cooper Hall from Deposit Hancock. Frank Cincotta (170) and William Sutherland (285) also came in 2nd place for Rondout Valley. Nikko Walsh (99) and Hayden Baker (145) finished in 3rd place while Tim Pereira (106) and Kevin McColgan (285) took 4th. Evan Barczak wins the 152 bracket with a 10-0 major decision over Kade Laughney from West Morris Central, NJ. Awesome performance by Evan! Marco Vespa finished 4th at 120 and Cam Wernicki took 6th at 132. Monroe Woodbury finished 5th in the team race. Great job by the Crusaders! 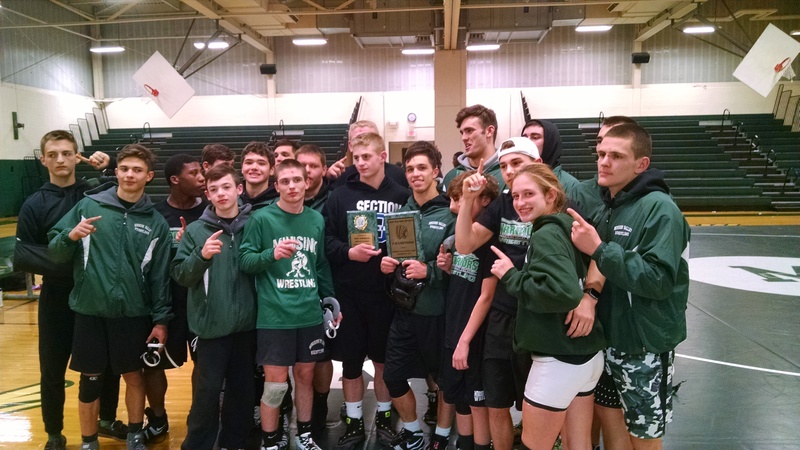 Host Minisink Valley went 4-0 and took home the first place trophy at the Jim Wilson Duals on Sunday. Warrior 195 pounder Andrew Covais was awarded the Frank Carrozza MOW as voted on by the coaches, while MV 182 pounder Joey Yanis won the Don Simmons Aggregate Pin Award with 4 pins in a combined 3:07! Washingtonville’s Brandon Bobe picked up his 100th career win when he teched VC’s Quinn Robinson 18-2. Congrats to Brandon! Wallkill crowned 2 champs, 3 runner ups, and 2 thirds at the Clarkstown North Tournament this Sunday. Note: Wallkill’s Avery Ellison, James Faison, Brad Bonner, Joe Pushman, and Billy Kras were not entered. Pine Bush took 1st of 7 Teams at Sunday’s Pawling Invitational. Horace Greeley came in 2nd place while Pawling finished 3rd. Pine Bush had 3 champions in Kevin Urena (113), Tommy Askey (120), and Derrick Magsamen (126).